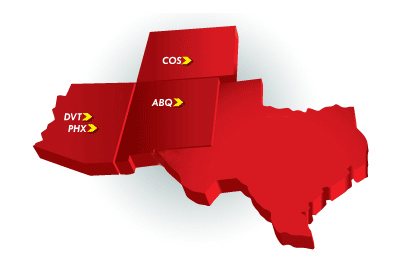 Cutter Aviation is proud to offer full line services and aircraft fuel at 4 of our FBO locations across the Southwestern United States including: Albuquerque, NM (ABQ); Colorado Springs, CO (COS); Phoenix Deer Valley, AZ (DVT); our headquarters in Phoenix, AZ at Sky Harbor Int’l (PHX). Our line services teams at each location are the best in the industry and we guarantee that you’ll have a smooth and stress-free experience with your aircraft in our care. Our line service technicians are NATA Safety 1st trained and receive additional training each year to keep up-to-date on the latest equipment and standards in the industry for FBO line services and ground handling. Our team also follows the standards of our own industry-leading FBO-SMS (Safety Management System) program to ensure the safety and security of our customers, their aircraft, and our fellow team members at all times. Combined with the superior fuel products from Phillips 66 Aviation, you can expect the best quality and value for your dollar at a Cutter Aviation FBO. Please refer to the chart below for the updated Jet-A and 100LL/AVGAS fuel prices for each of our Cutter Aviation FBO locations. All prices reported below are the most up-to-date retail prices per gallon at each of our FBO locations and include all taxes and fees and are considered “out the door” prices for your convenience in planning. Volume pricing is available and we honor select fuel programs at each location – please contact the FBO for full details on each before making your arrival plans. 2502 Clark Carr Loop S.E.